This Module is newly design,which can light up about 10PCS IN-14 NIXIE tubes with 10k resistor in serial under the 5V DC in. 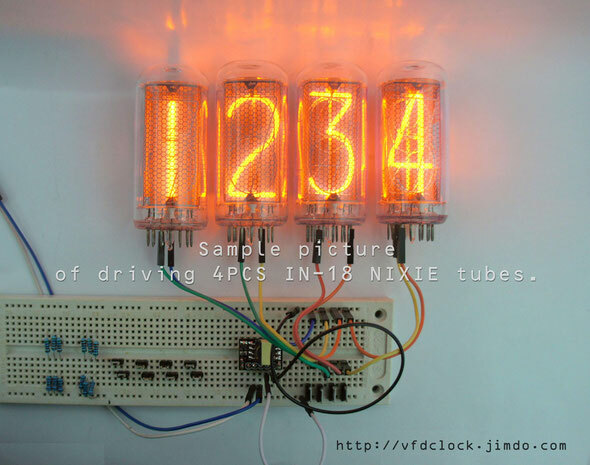 Now all of NIXIE fans can use the 5V USB power to drive the NIXIE clocks. Module is pretty small,and with high eff,the module got almost no heat. THIS MODULE CONTAINS DANGEROUS, HIGH VOLTAGE POTENTIALS. USE CAUTION. DO NOT TOUCH ANY PART OF THE MODULE WHEN IT IS WORKING. 1. Standard 0.1"(2.54mm) pins, easy to be used, can use bread board or DuPont-Wires etc. 7. Do not connect the modules' outputs in "Parallel Connection"!!! 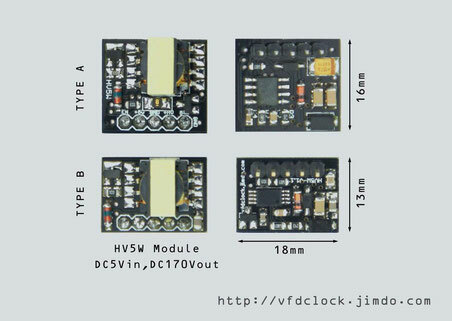 HV5W is a newly designed high voltage module, it works under 5V USB power, with ~170V DC output, especially designed for driving the NIXIE tubes. 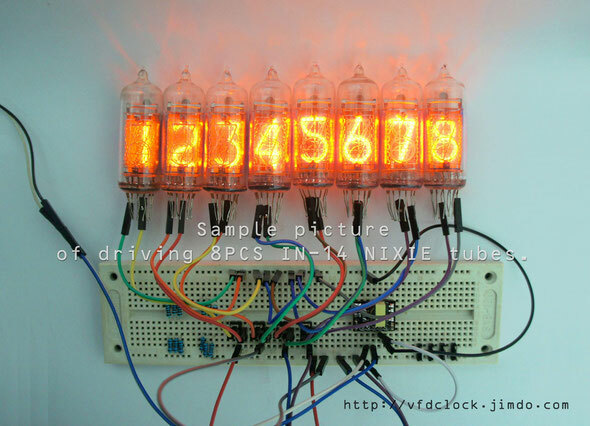 The max power output is enough for lighting up 6PCS IN-14 NIXIE tubes + 4PCS NE-2 neon bulbs. Low EMI and with No audible noise. It contains an ENABLE pin to turn the module on/off, and can be controlled by an regular logic signal, like a MCU's GPIO PIN. We use the same module in our new "6-Tube IN-14 Clock" design, the prototype has been working for over 2 month under 24*7 condition, the clock worked fine, and the module got almost no heat. * You can use the middle 3 pins only. 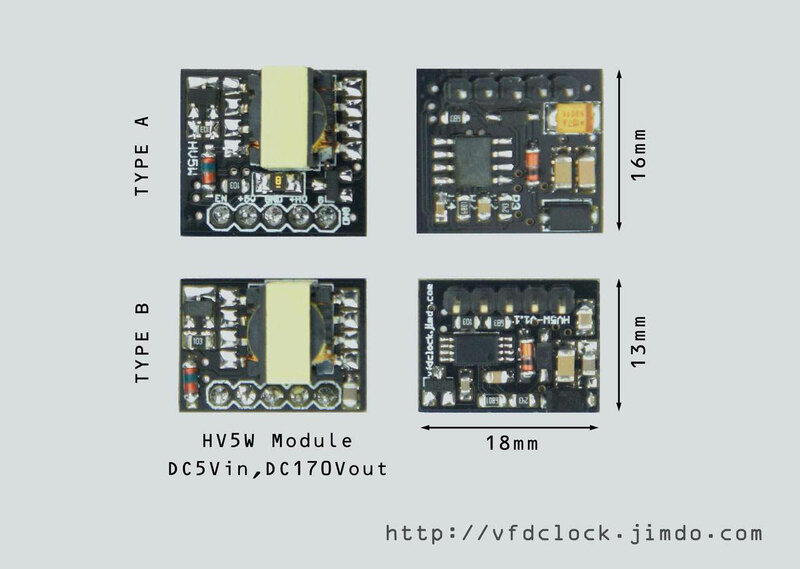 For 24*7 continually working condition, we recommend you control the input current less than 800mA when under 5V in, it keeps this module working under the low heat condition. And this module is also suite for driving 6 tubes IN-18 clock, you just need to use two modules for driving it. Each module can drive 3PCS IN-18 tubes + 2PCS NE-2 neon bulbs (as dots) with no problem. 2. Lighting up 6PCS IN-14 tubes, the HV output=166.2V; Worked fine in 24*7 condition. 3. Lighting up 3PCS IN-18 tubes, the HV output=164.6V; Worked fine in 24*7 condition. 4. Lighting up 6PCS IN-18 tubes (For testing only.) (All with number "8" been lighted up), the HV output=162.5V, all the tubes can be lighted up in high brightness. After working for few minutes, the module goes heat, the input current keeps increasing slowly, after the input current went over about 1A3, the module entered the protection mode. The data shown below is for reference only!!! 1. En pin = high (default) will turn the module on. 2. Module contains input reverse polarity protection. 3. Module contains over current protection circuit, when over power or over heat it will turn off the HV output, you need to re-power on to rest the module. Really good news! Gone are the days that nixie tube projects need 12V power supply due to the boost converter's design requirement. Hope to check out the new stuff soon. Would you consider publishing the schematic for these power supplies? I am a student and would like to know how these work in details. For the customers outside China,can buy via ebay directly. Is the output voltage adjustable by adding a trimmer resistor like on the DIY KIT-USB Power-HV5W-E DC-DC module?